I am in love with Crate Paper Wonder. I've used it on layouts about dance and Alexa's cat, plus I've made a number of cards with the collection. In this case, it was perfect for a first birthday card, complete with a tag that says, "stay curious". The sweet animals are hard to resist. Beautiful! LOVING the colors, the jar and the bow!!!!!!!!!!!!!! This is just too sweet, Lisa, especially the bow and the little critters! 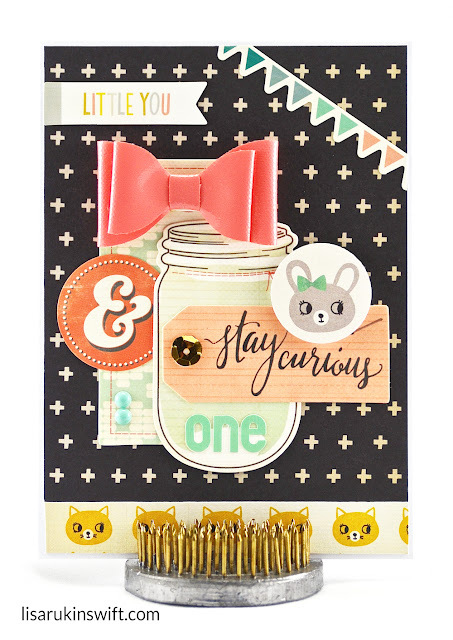 Marvelous background on this card and SO SUPER cute - love the sweet, adorable-ness it has to it!! Wonderfully done and that paper bow is the icing on the cake for this beautiful and perfect card!!!! Happy day to you!!! LOVE the color combo, the bow and the jar!! !